Should you Clean Your HVAC Filter or Just Replace it? When was the last time you changed the air filters in your home? It’s not something we think about often, but keeping up with your air filters can save your lungs, your HVAC system, and your bank account. Keep the air in your home clean and free of allergens and dust. This is especially important for families with pets, or people with allergies or respiratory issues such as asthma. Dirty air filters will circulate dust and allergens through your HVAC system, spreading them through your home. Keep energy costs down. Clogged, dirty HVAC filters make your heating and air system work that much harder to circulate air throughout your house. The harder your system has to work, the higher your monthly energy bill will be. Regularly maintaining your HVAC filters can help you save between 5-15% on your utility costs every year. Maximize the life of your HVAC unit. A dirty filter is the number one reason that heating and air conditioning systems break down. When the filter is clogged, your system has to work harder, which can cause it to overheat. With enough damage, you might be forced to purchase a new HVAC unit for your home. 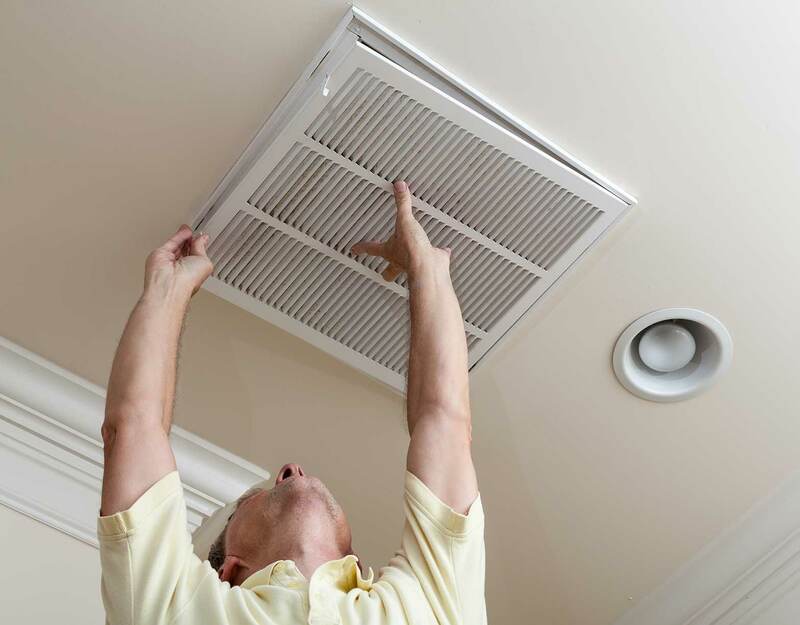 Whether you’re trying to improve the air quality in your home for health reasons, or you want to cut down on energy and maintenance costs in your home, regularly cleaning or replacing your HVAC filter is a cheap and easy step in your home maintenance routine. To determine how often to change or clean your air filter, check the filter’s labelling or ask your local HVAC technician. Recommendations are usually to change or clean your air filter every 1-3 months. Should I clean or replace my HVAC filter? The answer depends on the type of filter you have. Disposable filters should be thrown away once they become dirty or clogged. These filters are cheap (most cost between $1-4) and have cardboard frames. It’s a good idea to keep several of these on-hand so you can replace them throughout the year. Permanent filters are more expensive upfront, but can save you money in the long-run because you can clean rather than replace these filters. Rather than cardboard, permanent air filters usually have fiberglass frames. To clean your HVAC filter, first turn off your heating or air conditioner. Locate your HVAC unit’s service panel, and open it to find the filter. Clean the filter with running water, such as your sink or garden hose. Allow your HVAC filter to air dry completely before reinserting! When shopping for a new HVAC filter, check the MERV (minimum efficiency reporting value) number on the label. It will range between 1-12, and indicates the quality of the filtration. Aim for the higher numbers. If you have trouble remembering to replace or clean your HVAC filter, try setting an alert on your phone. If you have a pet that sheds a lot, be sure to sweep or vacuum your floors regularly to keep your filter from clogging too quickly. In addition to cleaning or changing your filter, it’s important to schedule HVAC system maintenance checks twice per year to prevent issues and give your unit a tune-up. Contact Cook’s Heating and Cooling today to schedule an appointment in Winston Salem, NC!